Over the years, SKL has helped build new schools for kids in Laos thanks to you, the contributors, and donations from compassionate people all over the world. The following schools were built in various regions and provinces of Laos. The schools are named after those areas. Our very first school building project was Ban Thachampa primary school which is situated in Saythani district, 46 km northeast of Vientiane. Ban Thachampa, the least developed of all 104 villages in the Saythani district, is a farming community consisting of 90 families who live off their harvests and livestock. In 2007, its existing school was in very poor condition. 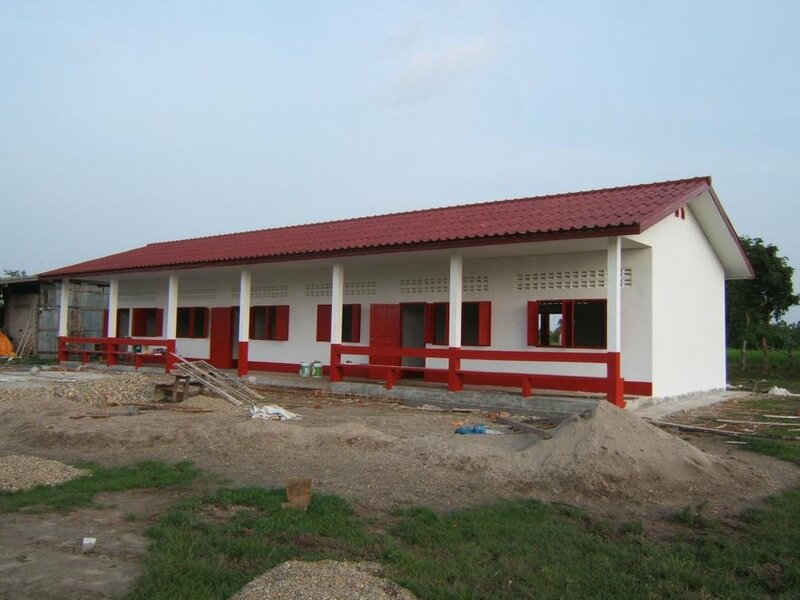 SKL built a new fully, furnished school with a much improved learning environment for the children. Our second school is located 3 km east of Vientiane in BNS, Pak Ngeum District, Vientiane. It is a poor, but growing village consisting of 94 families, 479 inhabitants who are, for the most part, subsistence farmers. In 2009 when SKL visited to site to determine its eligibility for a new building, they found the existing school structure in a dilapidated condition with a dirt floor, broken bamboo and twisted corrugated metal walls, and broken furniture. 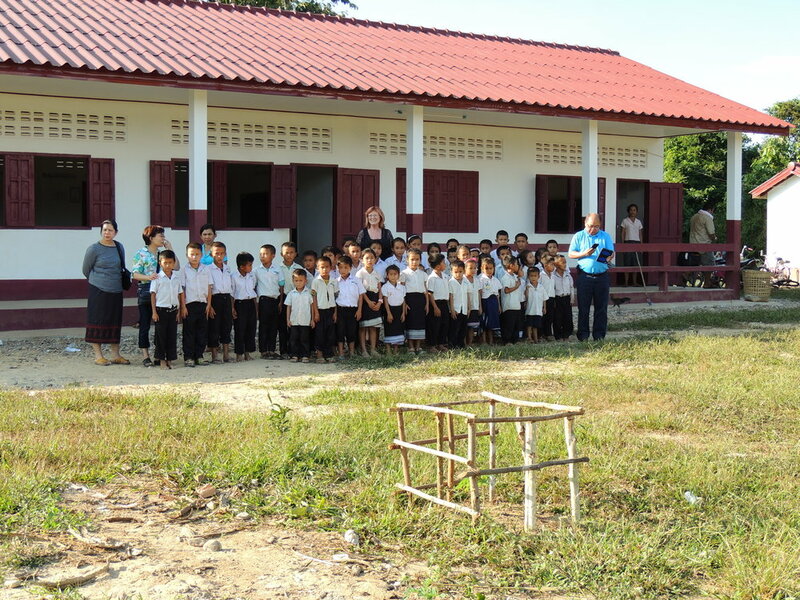 The ramshackle structure accommodated 64 school children from grades 1 to 3.
International foundations have noticed what SKL has accomplished in Laos. With the help of the Philanthropic Foundation of Washington D.C., This school was built in Ban Kava in the central part of Laos, Hinboun district, Khammouane province. Not only did it serve a relatively large number of students from neighbouring villages, it also showed potential for future growth. There were 86 students in grades one to five attending the school, with many more expected the following year. Pakxoun Primary School is located in Pakxoun village, district of Pak Kading, province of Khammouane, approximately 180 km (3 hours drive) southeast of Vientiane. When SKL visited in 2012 to determine eligibility, the existing school housed 34 students from grades 1 to 3. Since it was a relatively new settlement, the village was expanding and school enrollment for September 2012 was expected to increase by 59% (to 54 students). 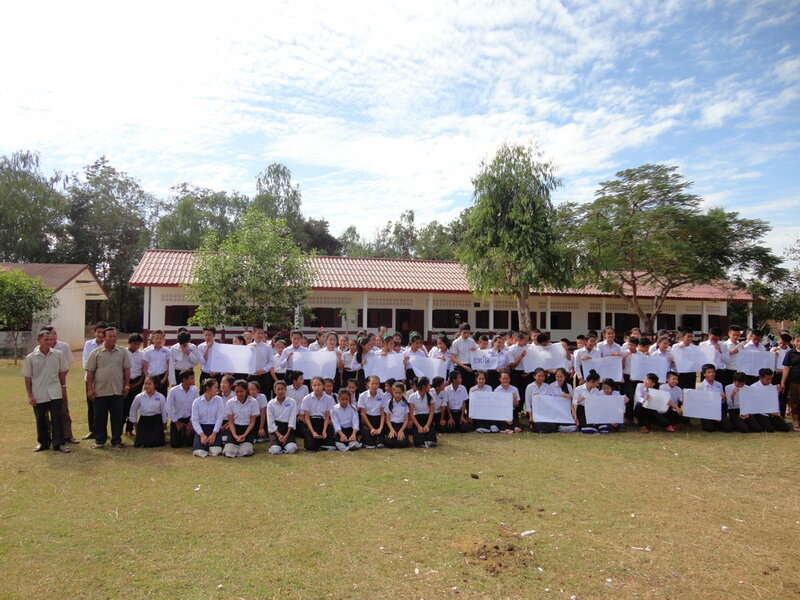 Viengkham Lower Secondary School is about a 2½ hour drive northwest of Vientiane in Vientiane Province. The school housed 235 students and had 17 teachers on staff. It serves six villages. The student population increases by 25-30 students per year. There were three buildings, two of which were temporary bamboo and wood structures with dirt floors. The students needed an appropriate learning facility and as such, required five new classrooms. They had a well but it was running dry and so the school would benefit from a new deep water supply. SKL scouted three locations and found Ban Na Chantai met required criteria. The village is located in the southern province of Savannakhet, an eight-hour drive south of Vientiane which meant increased costs to build the school. There were 110 students in the school with three teachers. However, authorities agreed to hire at least two more teachers for the new 5-classroom school. The existing building had dirt floors, and huge holes in the walls, exposing students to the elements. Construction commenced in February 2018. Scheduled completion August 2018. This school is sponsored by the Wasabi Group of Winnipeg, Manitoba, Canada. Ban Na Yè is located in Vanvieng District, Vientiane Province, approximately a 4-hour drive north of the capital city. The village, surrounded by organic orange orchards, is expanding rapidly as Highland people are enticed by local government to settle in the low lands. The existing school is in a severe state of dilapidation with dirt floors and tarps separating "classrooms". There is no electricity and no water source. There are 138 students in Grades 1-5. Construction commenced June 2018. Scheduled completion December 2018. The village of Kangxé in Savannakhet province (9-hour drive south of Vientiane capital city) is a poor community located in one of the most under-served regions in the country. The existing school is in serious disrepair and too small to accommodate all the children in the village. Thanks to continued support from the Millennium Volunteer Group of Singapore, the McAdam Foundation, the Hastings Foundation, the Manitoba Council for International Cooperation, The Philanthropic Foundation of Washington, DC, Phouvong Phamisith in Vientiane and generous donors from Canada, USA, and Laos, the school children of Ban Kangxé and local villages will have a new school with sanitary washrooms, running water and electricity. We are proud to announce SKL's 9th school-building project! We are currently seeking donations ($65,000) to build a school for the children of Ban Nong Chung. Located in Hinboun district, Khammouane province, a 5-hour drive south-east of Vientiane capital, it is a growing village populated with 438 inhabitants, mostly subsistence farmers. The existing 3-room school is in dilapidated condition with dirt floors, and huge holes in the walls, exposing students to the elements. This is a map of all the schools we have built together in Laos. Click on the top left box to see the list.